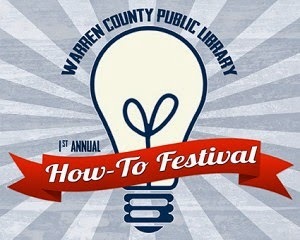 For all of you who live near Bowling Green, Kentucky: Warren County Public Library will host its first-ever How-To Festival at the Bob Kirby Branch Library Saturday, August 16. A variety of how-to topics will be showcased in half-hour sessions, and each one will feature an entertaining demonstration, educational workshop, or interactive class presented by experts in those areas. This will be a very fun activity, it's free and I will teach one session at 10:00 in classroom 1. I hope to see you there and have fun together!